Sterling Shipyard has forged a solid reputation for new design services with Auto CAD capabilities, construction maintenance and repair of all types of vessels. Sterling Shipyard can complete all your marine needs. Sterling Shipyard has a 1350 ton capacity drydock as well as a 900 ton capacity drydock. 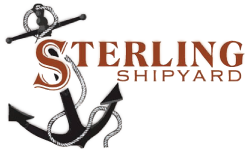 Utilizing state-of-the-art equipment, Sterling Shipyard can complete all your marine needs. We have successfully completed an impressive variety of marine projects. New construction, Structural repair and minor repairs and maintenance, Sterling does it all. View some of our recent work. ~Perform for our customers the highest level of quality construction services at fair and market competitive prices. ~Ensure the longevity of our company through repeat and referral business achieved by customer satisfaction in all areas including timeliness, attention to detail and service-minded attitudes. ~Maintain the highest levels of professionalism, integrity, honesty and fairness in our relationships with our suppliers, subcontractors, professional associates and customers.